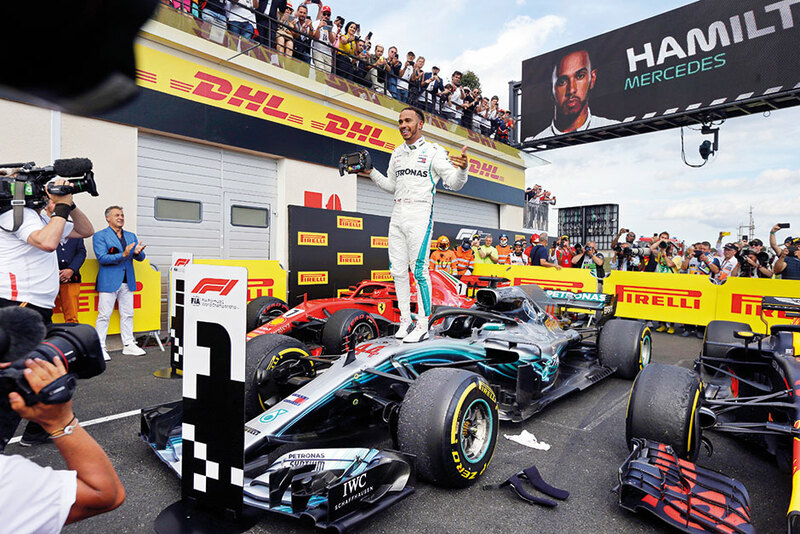 Le Castellet, France: Mercedes driver Lewis Hamilton won the French Grand Prix from pole position to retake the lead of the Formula One title race on Sunday. Defending champion Hamilton was never challenged after he reached the first corner a split second before erstwhile leader Sebastian Vettel knocked into Hamilton’s teammate Valtteri Bottas. Vettel needed a new front wing for his Ferrari and had to work his way from the back of the pack to settle for a fifth-place finish behind Red Bull’s Daniel Ricciardo. Hamilton has 145 points after eight races. Vettel, who entered the race with a one-point lead, leaves trailing by 14. It was Hamilton’s 65th career win and his third of the season. Only Michael Schumacher has more victories with 91. There was drama at the start as Hamilton and Mercedes teammate Bottas lined up on the front row with Vettel just behind in third. Renault’s Nico Hulkenberg took ninth place with Monaco rookie Charles Leclerc a fine 10th for Sauber and denying Haas’s French driver Romain Grosjean his first point of the season.